[By Nick] Ahh, Tofutti. I still remember the first and only time I've ever had you. It was during my middle school years when one of my friends was going through their "being a vegan is cool" phase (fyi: it didn't last long). She offered me an "ice cream" sandwich and my naive mind thought it would be like normal ice cream. I was so very wrong. Long story short, we barely talk anymore and that sandwich went into the garbage right after my tastebuds recovered. Okay, I'm being a little over-dramatic but it definitely didn't go too well. It really wasn't until a recent episode of The Nosh Show in which they were mentioned that I even had thought about their existence. 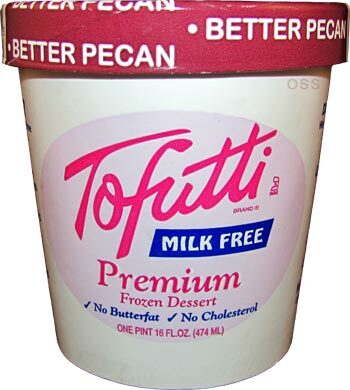 The next day I found myself in the Niskayuna Co-Op and wouldn't you know it, they stock the majority of Tofutti's pint flavors. I easily opted to grab their Butter... I mean Better Pecan flavor for obvious reasons. Being that there's no description, I really can't bash them for any of the usual things I find offensive when it comes to a Butter Pecan flavor. Removing the lid and things look actually pretty good. There are some pecans and what looks to be some sort of swirl. Digging in, this stuff is actually pretty good. To say I'm shocked right now would be an understatement. The base flavor doesn't remind me of anything reminiscent of Butter Pecan or pecans in general. There's almost a whipped cream type flavor going on. That actually works fine because the texture is similar to cool whip as well. It's not creamy so to say but it's not frozen dairy dessert airy either. It's actually quite enjoyable to me. Now on to that swirl I saw earlier. Well that's what really won me over actually. It's full of brown sugar and butter pecan flavor. Mixed with the cool whip like base, there's a pecan pie vibe here. I want to see other companies make a swirl like this because it's pretty awesome. The texture of it is hard to describe. It's kind of crunchy at times but gooey at others. Think of it as a runny but crunchy peanut butter if you will. 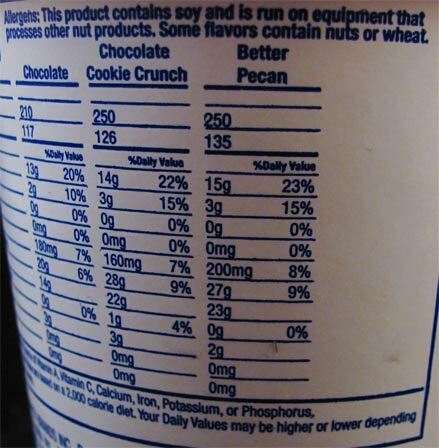 Add in the pecans that are already in the base and you get one of the better non dairy desserts I have ever had. All these years of avoiding Tofutti might have been for nothing. Looks like I'll be trying more of their pints out in the future! Verdict? Pecan pie... for vegans... that's actually good! Buy Again? After I try some other flavors. 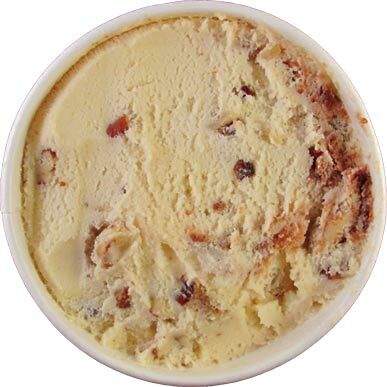 I've always avoided Butter Pecan ice cream due to the nut factor, but after this review, I just might have to try this one. 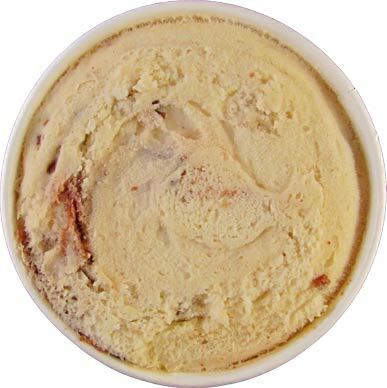 I HIGHLY recommend trying the So Delicious brand of almond milk-based Butter Pecan ice cream. Stride, there's still nuts in here and way better butter pecan options out there aha. Liz, I've actually been on the look out for that one. I did try the no sugar added coconut milk version awhile ago that I still need to post my review for though. So Delicious really makes good non-dairy ice cream. Their Purely Decadent line (hopefully still exists) lives up to the name, with either a soy or coconut milk base. Just be careful if they still are high fiber- that's from chicory root (inulin) and if you're sensitive, you'll regret pigging out. Not just speculating here. jwoolman, I have a big pet peeve when people call non-dairy things ice cream. Names aside, I have tried a few of their products and have been pleasantly surprised. I'm not even a fan of coconut but I think I've preferred those bases to that of the soy bases. As for the fiber, they're still filled with them but thankfully I'm not sensitive. I think you'll have to learn to put up with the extended use of "ice cream", it's far more descriptive of the nondairy product than generalities such as "frozen dessert". If a chemist like me can become reconciled to the use of "organic" to describe food grown without synthetic pesticides (it took years, it's so unnatural, we don't use organic that way in chemistry) - then I'm sure with patience and support from family and friends -- you can become reconciled to "nondairy ice cream". jwoolman, no offense but your comparison is far form the same. Organic can have two different meanings while ice cream is regulated in definition as what can and cannot be labeled ice cream. While organic can mean one thing in the food world, it can also mean something else in the scientific world. The same wouldn't apply to ice cream and this is why So Delicious and similar brands no longer can refer to their products as ice cream and must be labeled non dairy frozen desserts.